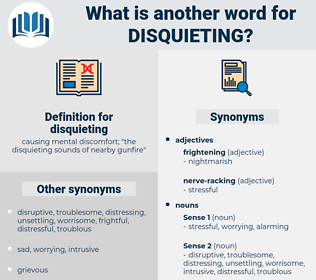 What is another word for disquieting? causing mental discomfort; " the disquieting sounds of nearby gunfire"
disturbing, troubling, worrisome, worrying, disconcerting, alarming, unsettling. disturbed, puzzling, shocking, troublesome, troubled, distressed, depressing, eerie, uncomfortable, daunting, staggering, startling, confusing, questionable, nagging, disappointing, unsettled, chilling, restless, threatening, unstable, worried, insecure, sinister, problematic, dubious. distressing, ominous, frightening, appalling, Preoccupying, uneasy, unnerving, sobering, concerned, scary. inviting, settling, pacific, comforting, calming, lulling, pacifying, relaxing, comfortable, consoling, narcotic, tranquilizing, soothing, quiet, sedative, tranquil, reassuring, restful, dreamy, peaceful, easy. Aunt Sarah was one of those disquieting persons who loathe telephones and note - paper. It was but natural that questions concerning the stability of other banks should be asked, and it was not long before many wild, disquieting reports were afloat. deck tennis, distance, decadence, deciding, disgusting, dictamnus, decadency, detecting, doggedness, dejectedness, dichotomise, decoding, distinguish, dissidence, dichotomize, dichotomous, Dustiness.